← The North Star Project, 2013 Summer Report Number Thirty-Four — St. Petersburg, Russia, Preparing to Head Back to the U.S. of A. Corruption unfortunately is not a foreign word to a Peruvian. Corruption has been part of our government as long as I can remember and is a major part of the political history of the country. 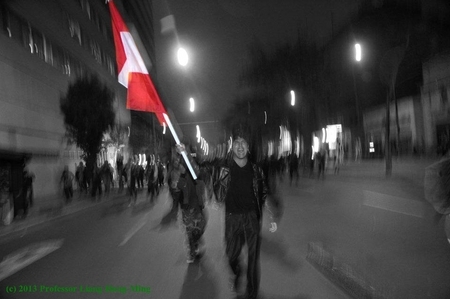 Peru has a booming economy, it is growing and it is constantly developing into a modern and stable, in the most loosely defined sense of the term ‘stable’ However, many aspects of the country are not moving forward and one of these is the permanent issue of corruption, creating instability and discontent amongst the citizens who now more than ever are fighting for Peru. In these times of struggle and political instability, Peru remembers the hard times it has been through and how it has overcome many hardships. Peru celebrates today a weekend of independence, democracy and freedom. Peru declared its independence from Spain on July 28th 1821, today it celebrates this triumph and remembers all the obstacles that made this nation stronger. As Peru celebrates its independence, the citizens also unite and gather to demand a better and less corrupt government. In this week of independence, several strikes and political demonstrations have taken place. Citizens have united to speak up for their rights and have demanded transparency and accountability from the government. The streets of the main square were filled with people chanting and screaming, “Peru te quiero, por eso te defiendo which roughly translates to Peru I love you, that is why I defend you. Something characteristic about these protests was that the young people of Peru are now speaking up and taking a stance for a change that they not only want but also need. 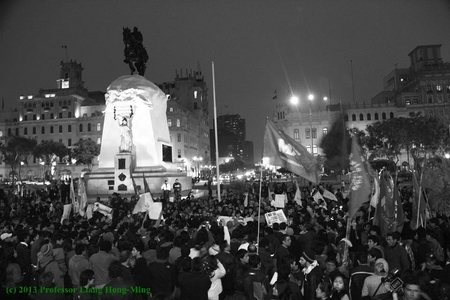 Thousands of people, mainly young citizens and key organizations such as the National Human Rights Defense Coordination, gathered in front of the congress to protest about “La Repartija” This refers to a political arrangement created by the government to benefit its own representatives. It is an unfair, corrupt, biased and unrepresentative election of government officials for this upcoming term. Officials were elected based on party favorites instead of being chosen for what they could bring to the table. A couple of examples of these poor choices include the public defender, head of the constitutional tribunal and head of the central reserve bank. All of which are key positions in the country. People are protesting because the government is not acknowledging the demands of the average citizen. The political atmosphere that surrounds the capital city of Lima is not one that promotes trust or transparency, instead the government projects uncertainty and instability. As the people walked through the main square, police officers and military itself tried to contain the until then peaceful protest with tear gas. This invasive action by the police shifted the entire protest into a chaotic scene where several people were arrested. 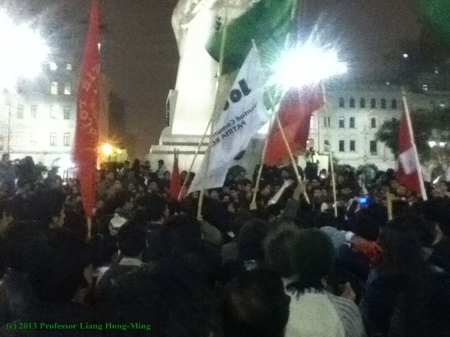 At the end of the protest, many highlighted that the protest was not only about the “repartija”, it also represented the degrading manner in which politics have been taking place in Peru. Protests like these are not uncommon in Peru, or in any other country in fact. However, in times celebration and regard for national pride and unity, protests of this sort tend to become a trending topic to emphasize that the people do not agree with the political aspect of the country. It is important to highlight that a well-established democracy is created from political, economic and social balance. The government must respect the autonomy of different social groups. Instead, today, Peru’s government is creating great polarization amongst its political entities. Peruvians are demanded a united front, we want a stable democracy, a government that is truly representative of all the citizens, not just the elected few. Peru has come a long way, but it is more than evident that there is still a long road laying ahead. Now more than ever the people of Peru expect more from the government, more from the country itself. Peru has a lot to offer, and its people know this more than anyone. The expectation from the people first and foremost is to have a decent government, which includes a decent power. Picture credit: Francesca Chacon and Giancarlo Castro. I admire people who stand up for their country. Even when they know that they do not have as much power as the people they’re going against. People risk their lives fighting for what they believe in and I absolutely applaud that. I find it amazing that there is a commonality from region-to-region and country-to-country that young people generally comprise of the largest groups when it comes to times of protest. When reading this article, even though this is dated, I kept Hong Kong in mind, as they are also protesting. I actually didn’t even know that the people of Peru were protesting at this time, and I wish that our media here in the U.S.A. would have covered it. We could perhaps learn something from them.